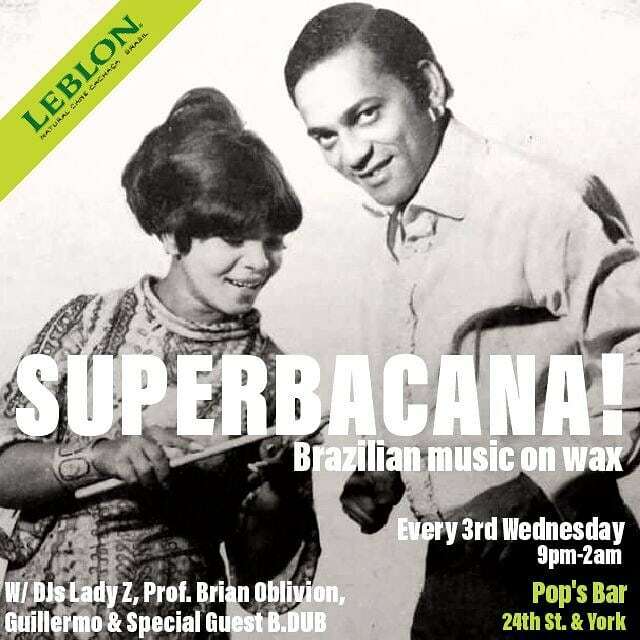 This Wednesday Guillermo, Lady Z & Professor Brian Oblivion bring SUPERBACANA! to Pop’s Bar, sponsored by Leblon. It’s a function that celebrates classic and rare Brazilian music on wax all night long. Bossa, samba soul, tropicalia, soul, funk, boogie, psych, jazz and more all from Brazilian artists with that distinct Brazilian swing. Warming you up all night are $9 Leblon Caipirinha Specials. Come through and bring your dancing shoes! 6-9pm with DJ CityHobb and DJ Brian. Punk, Post-Punk, Synth Wave Forms, Garage Rock, Rhythmic Blues & Purple Psychedelic Carnage. Samba, funk, bossa, tropicalia and more on vinyl all night long! Happy Hour Entertainment 6-9PM with DJ Mobando and friends. DJ Mobando brings a mixed bag, incorporating funk, hip hop, salsa and Afrobeat into his energizing sets. Whether its an all vinyl set or he’s digging through the digital files, he always unearths musical gems.